I took a bit of of a punt on my choice of hotel to stay at during our two night stopover in Athens. I’d never stayed there before, nor even heard of it…… It’s location on the edge of edgy Exharcia could have been a problem, and it’s name ‘Athens Way’, well, I’d hope that was not an indication of it’s management style. Look, dont get me wrong, I love Athens, despite it’s grungy, grafiti covered buildings, it’s potholed streets and pavements, ( pavements! you mean extra car-parking spots) it’s traffic chaos, the stray dogs ( how do they grow so huge?) and stray moggies….. and those F#%*ing pigeons! 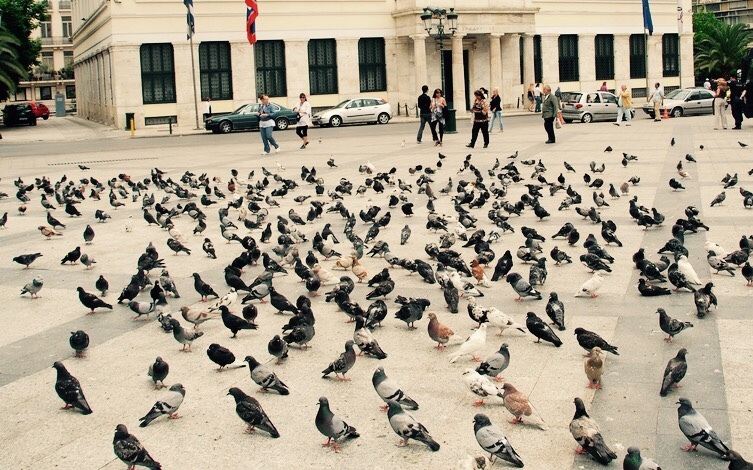 ( Seriously, if they had fur instead of feathers there would be a riot ….that would make a change for Athens…… bloody rats with wings is what they are. Maybe we ought to tell the Chinese that they are an aphrodisiac….problem solved!) I mean, what’s not to love about the place….. apart from these minor negatives it’s a vibrant city, frantic and chaotic, luxurious, artsy, funky, sleek and stylish, grungy, anarchistic, run down, decayed, grubby, fashionable, sleek and very very historic. ….. and did I say I love it ? 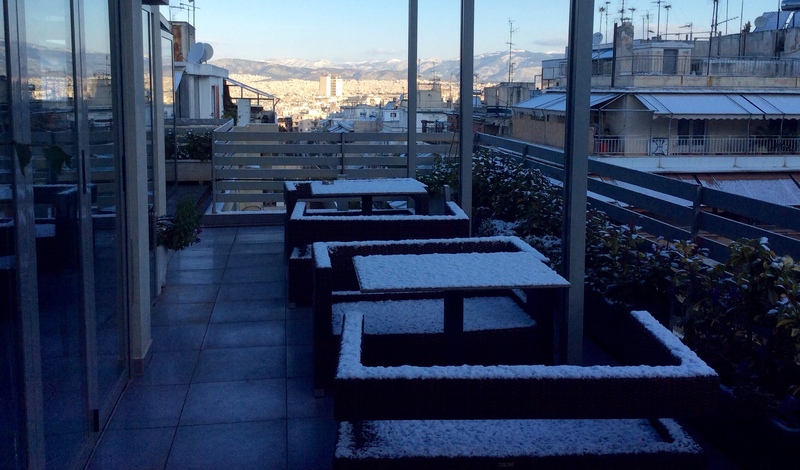 As I mentioned in a previous post, whenever I visit Athens I normally stay at the ‘Fresh Hotel’, a quite large but also boutique-y style hotel…. a very trendy and fashionable place ( my best mate Billy stays there!) just off Athinas Street and close to the famous Athens meat and fish Central Market, and a short walk down Athinas to Ermou Street ( Athens main shopping street) as well as Monistaraki and the Plaka. But I felt that I should make a change this time, and get to explore a different area. not an easy choice as most hotels are either in the highly touristic area around Syntagma and Plaka, or in the nasty Omonia Square area. Anyway, as it turned out, there was nothing to worry about my choice. The Athens Way Hotel is a clean, friendly well run place, large rooms ( I’d booked an apartment room, two adjoing rooms and a bathroom with shower) with all the facilities you need for a short stay. At only 60 Euro a night ,about A$90, and half the price offered by the ‘Fresh’, ( and a room 50% larger) it was a good find. …. 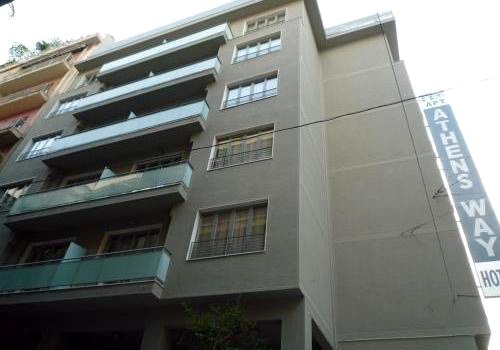 and a good location as well, only 10 minute walk to Syntagma along interesting streets. At reception, the young lady on duty offered us breakfast, as an option for just 5 Euro each, so I accepted. i mean, if all that was offered was a cup of coffee and a glass of OJ I figured it would be worth it….. . Set up on the top floor terrace, the breakfast buffet had both hot and cold dishes, fresh fruit, yogurt, fresh OJ, coffee, tea, eggs, bacon,cereal, toast etc….fantastic start to the day and what a surprise. 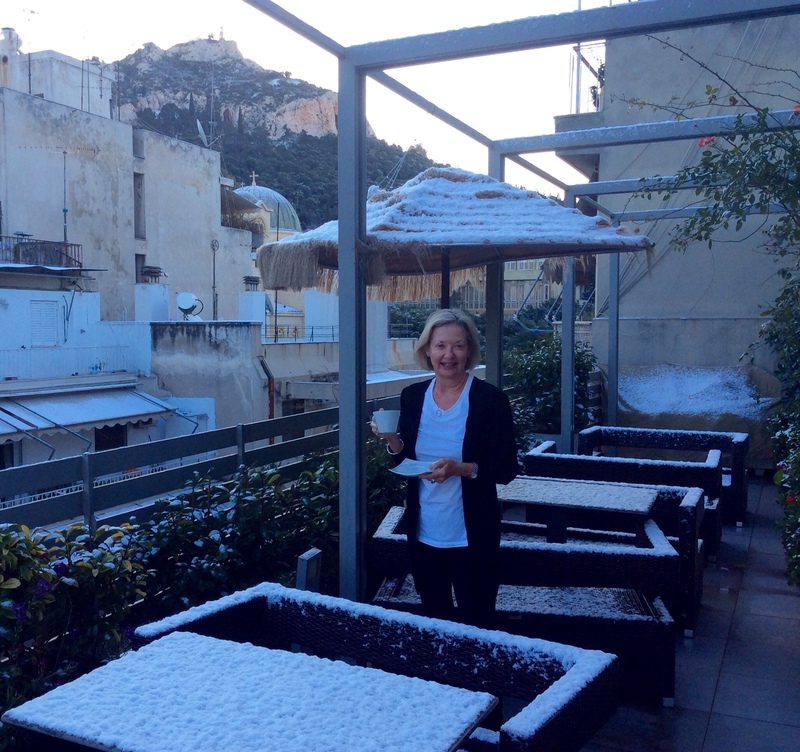 What was even more surprising was the snow covered terrace….. I’ve never seen Athens like this before, so pretty, but then I’ve never been here before in the wintertime….. and I never thought that I’d use the words ‘pretty’ and ‘Athens’ in the same sentence either! 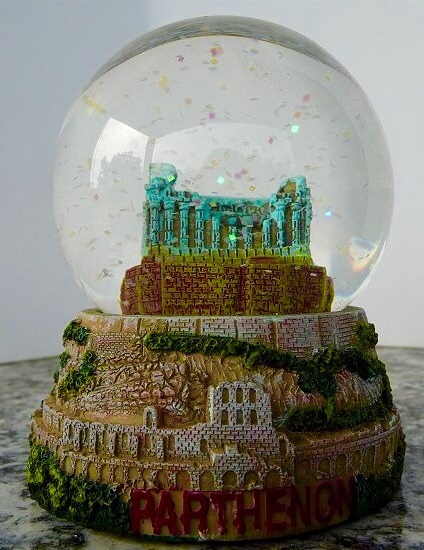 It certainly does improve the look of the place, and it crossed my mind that I should quickly grab a taxi, before the snow begins to melt, and go to the Acroplis and take photos of the Parthenon covered in snow. Like I said, it crossed my mind to do that, but the breakfast spread looked like a better option. But later in the day I did get a terrific shot of the Parthenon during a snow storm…. 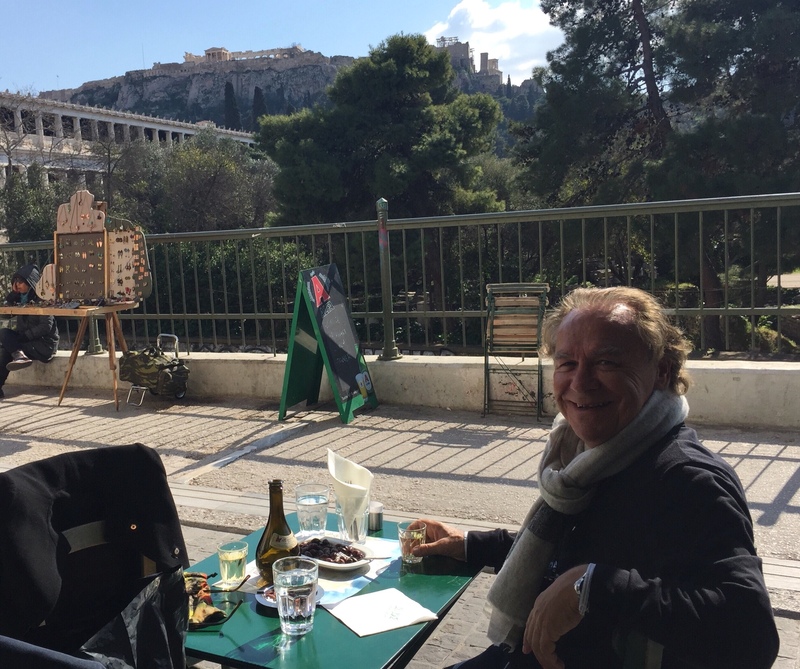 After a leisurely breakfast, YM and I set off to walk towards Syntagma square and down to the Monistaraki flea market, to see Yiannis, an acquaintance who, along with his Father runs an antique shop there. ( His father was a fellow crew member on the Chandris Line’s ‘SS Australis’ with me) We have bought a few things from him on previous visits, including a magnificent Tavli Table, so called in to say hello and see if anything else took our fancy. 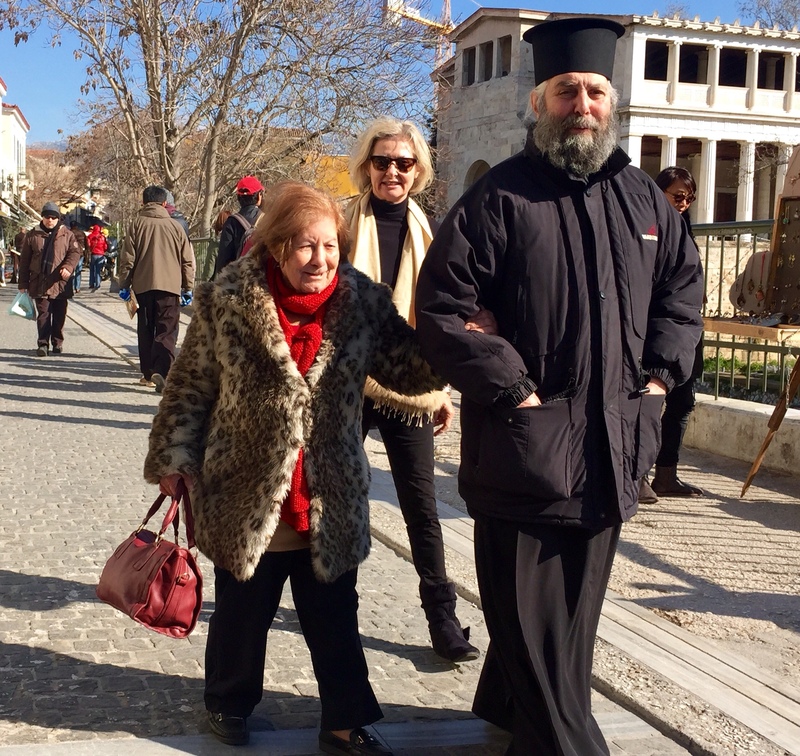 After a warm greeting from them both, and while we looked around, Yiannis sent his brother out to fetch us a coffee. If you are an Aussie fisherman you’d be familiar with the phrase ‘ to burley up’…. in other words, get fish biting by offering them some ‘burley’ first. So, while drinking our greek coffee ( Ellenikos Kafe) and chatting to him, YM notices a silver-plated cutlery set, that is exactly like the one we have at home. 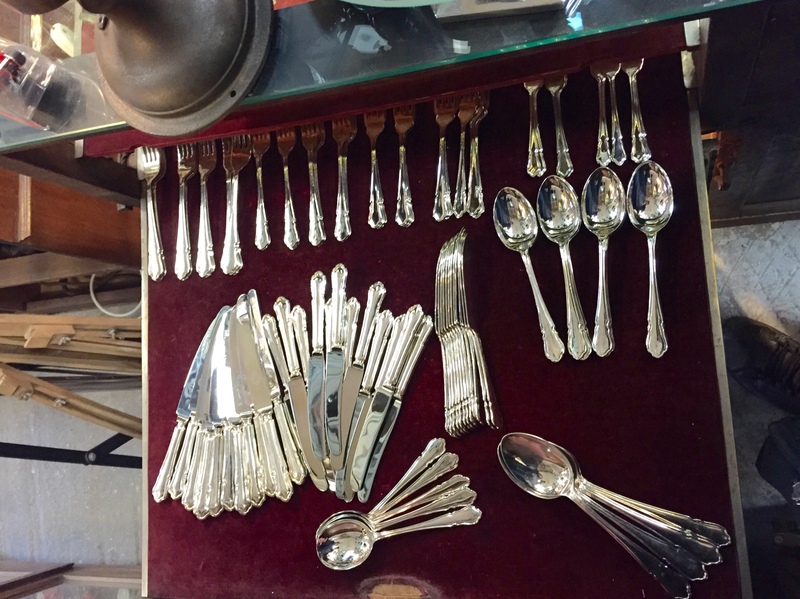 Despite my protestations….. why do we want another cutlery set, are we gonna open a bloody restaurant…. YM tells me that she wants it, nay, needs it, as the set we have in OZ is only a setting for 8 persons… Oh my god, I had no idea it was ONLY for eight people…. you know, 8 knives, 8 forks, 8 fish knives ( fish knives!) 8 soup spoons, 8 desert spoons, 8 table spoons etc. It seemed foolish of me to ask when we ever have more than 8 people for around for dinner, but ask I did…. (yep, foolish of me) . Apparently, at Christmas Lunch, on the odd occasions when do have a Christmas at home, we sometimes have ten for lunch….. this was all explained to me in detail by YM, talking in a slow steady manner, in the tone of voice that you’d normally hear from a primary school teacher talking to a class of ‘D’ graders! …… OK, so now I get why it’s so important to get the extra set ….. otherwise it means that two guests would have to eat lunch with non-matching cutlery….. can you imagine the humilation we’d feel !!!! The thought of adding another 10 kilos to my already overweight baggage, all within 12 hours of arrival, is just one factor contributing to my lack of enthusiasm….. the price tag is yet another, so I suggest that why dont we go and have a bite to eat, and a glass of wine (or two) and think it over. So we find ourselves around the corner in Adrianou, at cute little tourist trap called Taverna Diodos. its amazing how persusive a kilo of wine can be ….and a determined women! I also blame the two glasses of ‘Tsipouro’ ( a clear fiery drink not unlike Ouzot, but stronger… 40 – 50% alcohol) that the waiter brought to us, gratis and free, after our Meze lunch. YM didn’t like it, so I drank her’s ……. waste not want not eh…. but the waiter soon brought another two glasses of the ‘Tsipouro’ ….I hadn’t ordered it, but YM apparently had….. a nod and a wink to a greek waiter often works wonders. Our next stop was to stumble along the street and try to find a ‘hole in the wall’ that dispenses money…..an ATM in other words…. 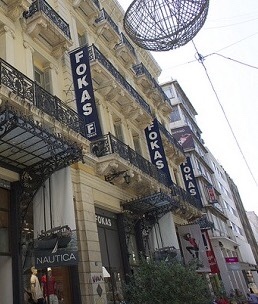 to extract the neccessary ‘Moula’ …Yiannis does not accept Credit Cards, ( of course not, this is Greece) only ‘Cash Money’…… and pretty soon, after handing over a thick wad of Euros, I was the proud ( proud?!!!) 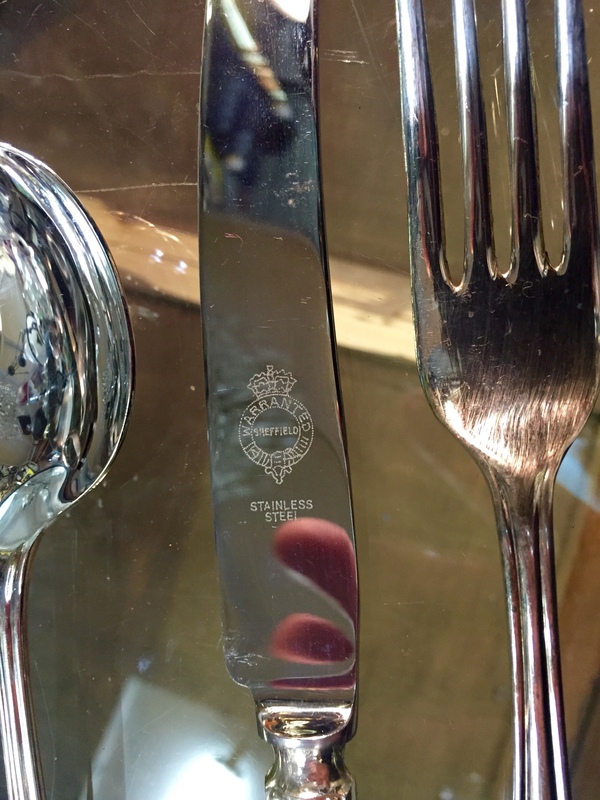 new owner of the “only one in the world like it” ‘Made in Sheffield’ cutlery set….. I wonder to myself just how long that Yiannis has had it in his shop….. he certainly looked overly pleased with himself…… our departure from the store was even more warm than our arrival that morning…..
Did I already say it weighed 11 Kilos? Well, while schlepping it back to our hotel it seemed to gain an extra kilo every few hundred metres….. It’s gonna be interesting tomorrow when we check-in for our short flight to Crete….. how will we get it onboard as hand baggage…. the spoons maybe, but knives?